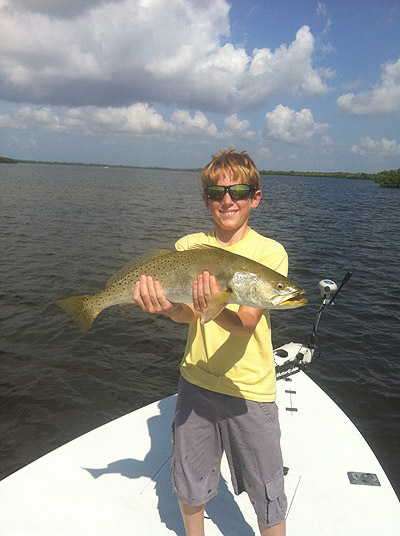 Speckled Sea Trout: Slivery with scattered spots all over them. When setting the hook be careful because they have very delicate mouths. Can be caught through out the year. During the coolest months trout move into creeks, rivers and deeper waters. As the water starts to warm trout move to grassy flats. Their size determines what baits they will prefer to eat. Trout are easily caught on artificial lures, early in the morning is an excellent time to catch aggressive fish on top water. As the day progresses try soft plastics. Seatrout found inshore and nearshore in and around seagrass meadows, mangrove-fringed shorelines, deep holes and channels and above oyster bars.